For everyone and everything there is a time to die. But even as Lirael and Nick return to the Clayr, a young woman from the distant North braves the elements and many enemies in a desperate attempt to deliver a message to Lirael from her long-dead mother, Arielle. Ferin brings a dire warning about the Witch With No Face. But who is the Witch, and what is she planning? Once more a great danger threatens the Old Kingdom, and it must be forestalled not only in the living world but also in the cold, remorseless river of Death. 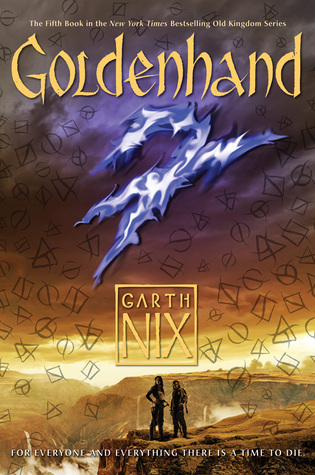 The Abhorsen series is an all-time favourite of mine, from back when a friend handed me a copy of Sabriel on the school bus and said ‘Read this. Then we’ll talk’. For me, this is the most perfect version of YA – there is romance but it doesn’t get in the way of the heroine taking care of business. The men complement the heroines, but don’t overpower them with their overwhelming man-ness. The world that Nix has created is just gorgeous, the rules of magic is very well structured and consistent – the world was once full of Free magic, until the Charter was created to take control of the chaos and bring some kind of order. Now, free magic beasties still exist and though they’re not necessarily evil, they are truly chaotic and can be dangerous. The best bit of this book is seeing Lirael, the shyest librarian that ever there was when we first met her in the book ‘Lirael’ (funny that), coming into her own. As Abhorsen-in-waiting, she has power over the dead and is responsible for keeping her kingdom safe. As such, she’s been gaining confidence without even realising it and is finally able to push back – former shy girls everywhere, rejoice! This book was like a tying up of loose ends from previous books in the series, there wasn’t a new big bad but an old enemy – we did get to meet some more of the locals outside of the Clayr’s glacier and the royal court though which was good fun! This story feels like more of a gateway to something even bigger and better coming up in the next book so I’m pretty excited!! I haven’t read this series yet, though I bought the entire first trilogy when it first came out. I have always had a feeling it is a good one. I should really find time for it. I can’t recommend the series enough – it’s a brilliant autumn/winter read too so you’re in good time!